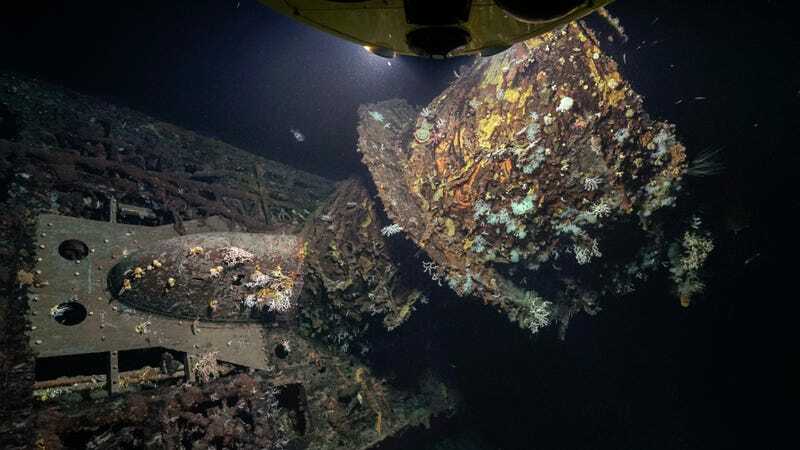 Researchers with the German Rebikoff-Niggeler Foundation found the wreck last September, but chose to withhold the finding until the precise identity of the sub could be confirmed, and because they wanted to make the announcement public on the 75th anniversary of the ship’s sinking. Working aboard the dive boat LULA 1000, the researchers were able to take hi-resolution pictures of the sunken submarine, revealing its condition and the many corals now clinging to its outer shell. The German submarine U-581 was the sister ship to the famous U-96 sub, which was featured in the 1981 war film Das Boot. An exterior mock-up of this sub was also used in Raiders of the Lost Ark (Spielberg rented the replica used in Das Boot). Over 560 VIIC-class U-boats were commissioned from 1940 to 1945, appearing in virtually all areas where German subs operated. Known as the “workhorse” of the German Kriegsmarine, these subs featured active sonar, and were powered by six-cylinder, four-stroke diesel engines. VIICs weighed 770 tons, had a range of 9,800 miles (15,700 km) and could cruise above water at speeds reaching 20 mph (39 km/h). During World War II, the Germans lost nearly 800 submarines of all types, and over 28,000 U-boat sailers. Around one or two subs are found by marine archaeologists each year, but an estimated 100 U-boats are still unaccounted for. A replica of the VIIC-class U-boat was used in Das Boot and Raiders of the Lost Ark (pictured). Over a tenure that lasted less than a year, the U-581 carried out two missions, and managed to sink one auxiliary warship (likely the armed British trawler HMS Rosemond). On the evening of February 1, 1942, U-581, working in tandem with another German sub, was tasked with sinking the British squad carrier Llangibby Castle. The Allied ship was scheduled to leave the port of Horta on the Azores island of Faial. But before it could carry out its orders, the U-581 was spotted by the British destroyer Westcott and hit by a depth charge near the island of Pico. Defeated and unwilling to hand over the damaged sub to the British, the commander of the U-581 ordered the crew to skidaddle, and deliberately sank the sub. Of the 46-man crew, four were killed when a water bomb was thrown at them while they were still in the water (apparently the result of a communication breakdown), 41 were taken prisoner, and one—quite incredibly—was able to escape. Officer Walter Sitek managed to swim 4 miles (6 km) to land. The Spanish officials who found Sitek repatriated him to Germany, where he survived the war (as did the German POWs). Researchers with the Rebikoff-Niggeler Foundation, with the approval of Portuguese authorities (the Azores belongs to Portugal), began the hunt for U-581 in the spring of 2016. Using sonar, they created a high-resolution, 3D picture of the seafloor in the areas where the sub likely sank. The sub was found on September 13, 2016 by a crew working aboard the LULA 1000. Images of the sub—found broken into two pieces—were used to confirm its identity. Work around the sub is still incomplete. The Rebikoff-Niggeler Foundation, in addition to studying the unique marine wildlife in the cold, deep waters, is hoping to create a documentary about the discovery.